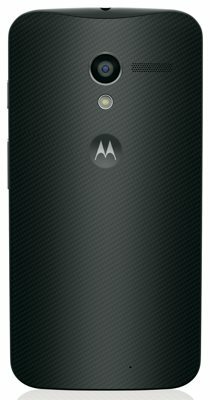 The Moto X in black (view larger). The first expression of the new Motorola, the Moto X for Verizon is the first smartphone to meet your desire for responsiveness with the best delivery of Google services. It's faster because it hears your voice and responds with Google Now. It tells you what you need to know, even when you're not touching it. You'll also be able to stay informed without constantly turning on your phone thanks to the new ultra-low power notification system. Pick it up, and the Moto X is curved to fit your hand. With a twist of your wrist, it becomes your camera. Use a simple gesture to instantly launch the 10-megapixel rear camera without unlocking the phone. An easy-to-use interface allows you to capture images faster -- just touch anywhere on the screen to snap a photo and quickly shoot a burst of photos. The comfortable Moto X features a custom shaped battery that filled the curved space and powers your Moto X through a whole day. Running the Android 4.2.2 (Jelly Bean) operating system, the Moto X is powered by the Motorola X8 Mobile Computing System, which includes a software optimized Qualcomm Snapdragon S4 Pro (1.7 GHz Dual-Core Krait CPU, quad-core Adreno 320 GPU), a natural language processor, and a contextual computing processor. 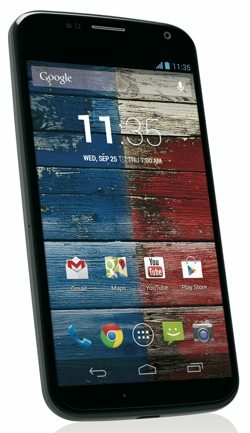 The Moto X has 16 GB of internal storage, and its 2200 mAh battery provides up to 13 hours of talk time and 10 days (240 hours) of standby time. The Moto X allows you to go from pocket to picture in just a few seconds, so you'll never miss a shot again. Whether your Moto X is in your pocket or already in use, just twist your wrist twice and it's ready to shoot. And because you can touch anywhere on the screen, it only takes one hand -- and just a few seconds -- to capture a perfect shot. The embedded Clear Pixel technology collects more light and snaps pictures up to twice as fast as other phone's cameras, so you can capture the darkest scenes or stop motion blur in bright light. The 10-megapixel rear camera has a 16:9 aspect ratio and can shoot video at up to Full HD 1080p resolution at 30 fps (frames per second) with slow motion. It also features auto HDR, a panorama option, photo burst, and a 4x digital zoom. The Moto X responds to your voice, without you having to touch it. 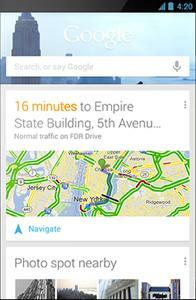 You just have to say: "OK Google Now" and give it a command. You can check messages, set an alarm, get directions, find out the weather, or do just about anything. With just a little training in a quiet room, your Moto X learns to recognize your voice. Then it knows you, even when everyone's talking at once. And thanks to the super low-power natural language processor, your Moto X is always ready with a quick response. Even when it seems to be sleeping, your Moto X is paying attention. Instead of a blinking light that doesn't actually tell you anything, information quietly appears on the screen. You don't have to wake your phone to look at the time or see your messages. But the active display is also smart enough to know when it's in your pocket or when it's placed face down so it won't deliver notifications, saving on battery power. As soon as you take it out of your pocket or turn it over, it discretely pulses with the time and any notifications you've received. When you need a little more info, just touch the notification icon and details will appear on the top and bottom of the screen. Drag the icon up and the app associated with the notification will open. Drag the icon left or right to make them all go away. Motorola Migrate: Wirelessly your old phone's stuff -- photos, videos, SIM contacts and even your call and text history -- from any Android phone in just a few steps. Motorola Assist: Recognizes when you shouldn't be bothered, like when you're sleeping or driving. You can set actions and exceptions so that they work exactly how you want them to. Motorola Connect: Read and reply to texts, and see who's calling your Moto X directly from your computer's Chrome browser. All without ever having to reach for your phone. Google Drive: Moto X owners get an extra 50 GB of Google Drive storage (on top of the standard 15 GB) free for two years to safely keep and share photos, documents and other files (for a total of 65 GB). 10-MP rear camera activates with two twists of your wrist (view larger).